According to Spanish media outlet, AS, Juventus are eyeing a move for Real Madrid captain, Sergio Ramos, in the summer transfer window. The report also quotes Italian Media, stating that the Serie A giants are looking to take advantage of the alleged dressing room clash between Ramos and Florentino Perez and Jose Mourinho's arrival to lure the Spanish defender out of the Santiago Bernabeu. Sergio Ramos is one of the best modern-day defenders and will retire as the most decorated defender of our era. Despite making headlines for the wrong reasons on the pitch throughout, Ramos has delivered in almost all the biggest moments in his glittering career so far. But the center-back is enduring a tough season along with his Real Madrid teammates so far. Poor results in the last 15 days saw them suffering to four consecutive defeats at home, which killed all their hopes of a major silverware this campaign. Real Madrid were knocked out by Barcelona from the Copa Del Rey and Ajax emerged as surprise winners against them in the Champions League, while two La Liga defeats against Girona and Barcelona meant that they are 15 points behind the league leaders now. Serie A giants Juventus are willing to take advantage of the situation by persuading Ramos to leave Los Blancos this summer. 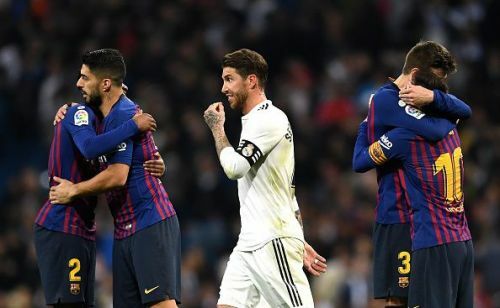 After their 4-1 embarrassment against Ajax, club president Florentino Perez berated the players which led to a clash with Ramos, who was suspended for the Ajax match due to a deliberate yellow card. Moreover, Jose Mourinho's last tenure with Los Blancos saw him clashing against some top players and Sergio Ramos was one of them. The Portuguese coach's likely return in the Santiago Bernabeu may cause problems with the Real Madrid captain. Juventus look to take full advantage of the situation and will bid for Ramos to reunite him with his former teammate, Cristiano Ronaldo. It is highly unlikely that Real Madrid will offload the club icon, who still has a few years left on his contract. Moreover, Ramos and Perez have already held peace talks as Ramos looks to inspire his team in the remaining part of the season. Real Madrid will be desperate to return to their winning ways as they travel to face Real Valladolid tonight in the La Liga.